LocaModa activated a 360 degree campaign for Clorox on both Miracle Mile and Fashion Show Clear Channel Spectacolor digital billboards in Las Vegas Monday. 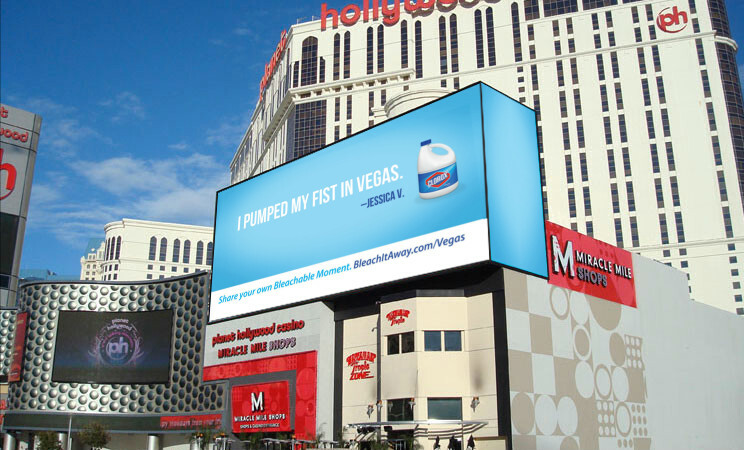 One of the three billboard’s call-to-action asks consumers to share their own bleachable moment by filling in the blanks to the highly provocative statement: “I _______ED MY _______________ IN VEGAS.” by visiting http://bleachitaway.com/vegas. With three variations of the statement, users will have more opportunities to be creative with their submissions. Users are then sent an email with a link to their ‘Bleachable Moment’ in a “Bleach It Away” online gallery. To insure the cleanliness, all user entries are moderated and selected entries are displayed 15 minutes of every hour for 24 hours a day seven days a week for the next 10 days. This entry was posted on Tuesday, January 8th, 2013 at 01:32 @105 and is filed under DailyDOOH Update. You can follow any responses to this entry through the RSS 2.0 feed. You can leave a response, or trackback from your own site.